It is chilling to the bones. Temperatures are dropping down with each passing day. When you feel like staying put inside your blanket the whole day with a cup of warm coffee, there are weddings and parties to attend. You wonder, style over comfort or making an entry in the most happening outfit, what should top your list. It is not a very difficult task. If it is the Indian look you want to carry off, that too in a designer lehenga saree, then we bring to you some of the finest designs to help you brave through the winter chill. Easy to tuck in, hassle free, lehenga sarees allow you to simply tuck and drape this stylish outfit. When picking up a lehenga saree for your winter parties, keep in mind the fabric. Go for thicker ones, like velvet and silk. These are warmer than the rest and definitely look good as well. Apart from the winter rule of wearing dark colors, go for brighter hues to dazzle in the winter cold. Since it is cold you can go for the traditional choli that is worn with a lehenga. A full sleeves choli will again help you to keep warm. Instead of low cut ones, you can opt for high neck ones or with a Chinese collar. These look very elegant and stylish. 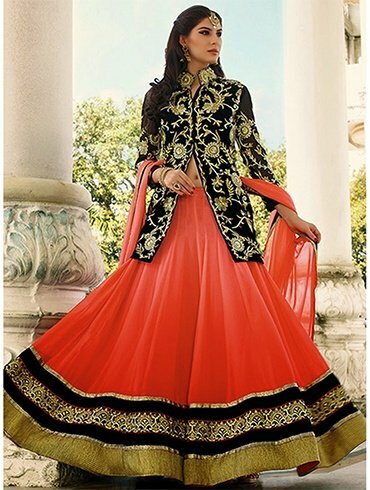 Another option is to opt for stylish jackets with the lehenga sarees. 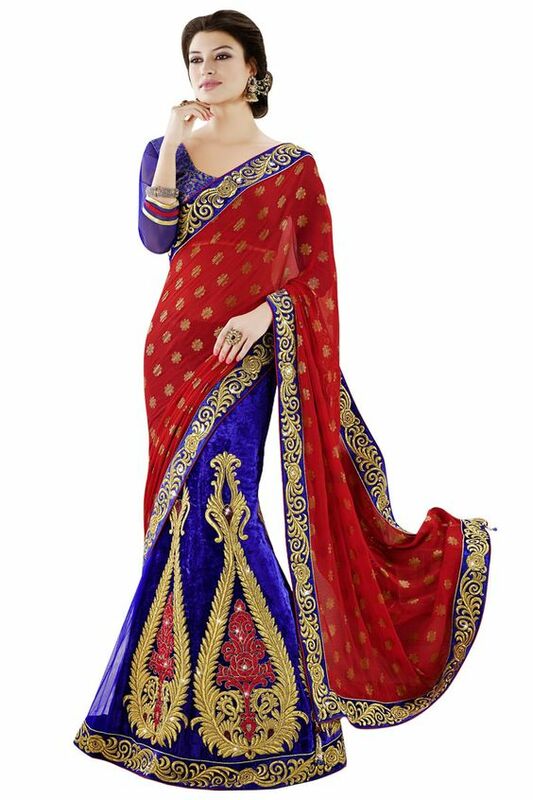 You can either go for a contrasting color or a plain one, so that the lehenga saree is highlighted and doesn’t get over-shadowed by the jacket. If you feel you have to wear a sweater for your survival than either button it up till the top or leave a few buttons open. Then drape the pallu over your shoulder and bring it to the front in a straight line. Combine it with comfortable footwear that can be worn with socks. Ideal would be high-heeled shoes, or ballets and pumps. Whatever you pair your lehenga saree with, be sure to carry it with style and elegance to make a mark, whichever party you go to.